In part 1 of how to be more creative with your acoustic guitar playing, I ran you through two very cool techniques that you can use in your playing. In part 2 of this article I am going to present three more ways in which you can drastically increase your creativity on the guitar. Take your time to explore each approach below. There is much to be gained in regard to your guitar playing ability and creativity by doing so. Now I'm sure you know what an open string is, but truth be known most acoustic players do not realize the full potential of what open strings can add to their guitar playing on a creative level. Typically you will find open strings in open chords and melodies and riffs in the open position on the guitar. However, open strings can be used in any position on your guitar. Now let's take every note in the scale above that exists as an open string, and play it as an open string while leaving the remaining notes fretted. What a great sound and difference the open strings make when played against the fretted notes. Your guitar creativity will go through the roof when exploring this approach. - Take an existing melody in G that you know and replace all the relevant notes with open strings. The sound of these against the fretted notes on your guitar will sound really cool. - Try the same approach with the keys of C, A, E, and D. These work best because they contain a number of open string notes in them. - Once you have worked out your open string scale (ie. C, A, E or D) start creating melodies with them on your guitar. Use existing melodies you know and transpose them to your key if need be. - For many more open string ideas and how to apply them check out this ebook/audio on cool banjo roll fingerpicking patterns for your acoustic guitar playing. A capo is an essential stylistic tool that will enhance your creativity on the acoustic guitar. In a nutshell, a capo allows you to change key instantly on your guitar while maintaining the use of open chords and open strings. Think of a capo as a moveable nut or even your index finger when barring chords. It essentially functions in the same way. You simply clamp it down at a particular fret on your guitar. For example, to play a Bb chord on your guitar without a capo you would need to bar it. However, if you capo your guitar at the first fret you will be able to use an A open chord to get the same sound. Because placing your capo at the first fret of your guitar raises everything by one semitone. So an A chord, when played with your capo at this fret, sounds a semitone higher as a Bb chord. - Take a chord progression or song on your acoustic guitar that is in a key that has few open chords in it and capo at a position that allows you to use more open chords. - Take the riffs and melodies that you come up with using the open string approach from earlier and use your capo to make them possible to do in any key. - Take a chord progression that already has open chords and capo it anyway, in another position that gives you a new set of open chords. Even though you are playing the same progression, in the same key, it will still sound different because you are capo'd and using different open shapes. - Check out this ebook/audio on cool and unique ways to play your acoustic guitar with a capo for more in depth ideas to set your creativity on fire! A very unique, yet kind of obvious way to play your acoustic guitar is as a percussive instrument. We all know the melodic side of the guitar of course, but an increasingly popular way to approach the acoustic guitar is percussively. It is a wooden box after all, so why not? This technique will change the way you look at and play your guitar forever. The creative potential is huge, and to be quite frank, you will wonder why you never considered this approach before. You do not have to be a creative genius, virtuoso, or prodigy to take advantage of playing your guitar percussively. Like anything you can get some fundamentals down, sound great using them and then decide what level you would like to take it to. * The Percussive hits are indicated below the tab in the drum notation. This is often used when notating stuff for percussive guitar. In the progression above I am sounding the thumb hit (B.T.) with the side of my thumb on the lower area of the sound board of the guitar just below the bridge (see picture for reference). Think of this as a kick drum sound. 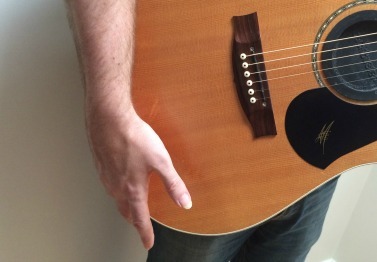 Be sure to flick your wrist as you hit the body of the guitar with your thumb. 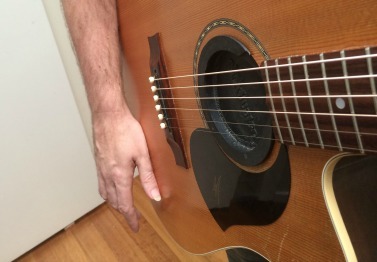 The snare sound (S) is achieved by tapping or rapping the side of your guitar just below the strap lock (see picture for reference). I like to use my 3rd and 4th fingers for this but you can try any combination to see what works best for you. Be patient with this, we are trying to create a higher pitched sound and it can take some time to be able to get this consistently. - Really spend time honing both the kick drum and snare sound from the example above. These alone, without any chords, sound really cool and you can create a lot on your guitar with them. - Listen to the drum beats of your favourite songs and emulate them on the body of your acoustic guitar using the snare and kick drum sounds. - Take existing chord progressions that you know on your acoustic guitar and integrate a simple beat using your kick drum and snare sounds. Don't get overwhelmed with the possibilities that I have presented to you in this article. Instead, be aware of them and choose one to explore at a time. If the result is you doing something different with your acoustic guitar playing than you otherwise would have without reading this article, then you are on the right track. I have spent countless hours on all approaches presented in parts 1 and 2 of this article with my own acoustic playing, enjoying many victories along the way. So expect the same and really enjoy the process rather than becoming impatient and wanting results instantly. To really kickstart your new found creativity on the guitar, download this free video/PDF all about how to play your guitar percussively. You'll never look at your acoustic the same way again.